Return of "The Man Who Called Himself Poe"
How a chapter from Starrett's 1928 book Seaports in the Moon got new life. In 1928, Starrett published a book unlike anything he had written up to that time. Seaports in the Moon: A Fantasia on Romantic Themes was an episodic novel that blended fictional and historic characters in a series of stories linked together by the adventures of a vial of water from the Fountain of Youth. In a brief prologue, Starrett explained that when he was a boy, he blended historical fact and fiction based on the hit and miss reading he did in his grandfather’s bookstore. For example, since no one ever told him Don Quixote was fictional, he thought of the man from La Mancha and his sidekick Pancho as adventurers in the same vein as Christopher Columbus. The book was not a best seller, but it had its admirers in the 1920s and through the following decades. One chapter in particular came to have a following: “In Which an Author and His Character Are Well Met.” It describes a delirious dinner Poe had in his last days, arguing with a man only he could see, William Legrand. Those who have read Poe’s short story “The Gold Bug,” will recognize that Legrand is the penniless man who deduces the existence of hidden writing and solves a cryptogram to find Captain Kidd’s treasure. It’s not giving anything away to say that Starrett's story has a melancholy ending, which perfectly fits the last days of Poe’s life. Certainly Sam Moskowitz thought so. 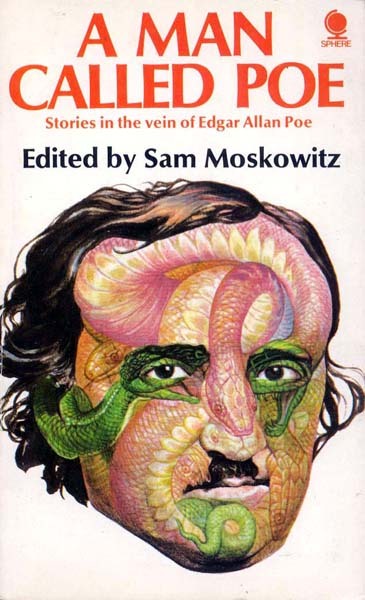 An occasional writer and lifelong fan of science fiction, fantasy and horror, Moskowitz edited many anthologies throughout his life. One of the most popular was The Man Who Called Himself Poe, published in New York by Doubleday & Company in 1969. It was also published by Victor Gollancz Ltd. in London in 1970. Along with the contract was a brief letter from Starrett to Moskowitz. Dated 25 September, 1966, the letter is an encouraging one from one old Poe fan to another. Sam Moscowitz, Esq. (As Poe would have written it). Starrett's letter to Moskowitz permitting him to reprint "In Which an Author and His Character are Well Met." Sorry for the delay in answering your letter of the 8th. I’ve been having a bit of eye trouble. I like your idea about the Poe anthology. It sounds like a win-ner. If I think of any stories that I think should be included, I’ll certainly let you know. If any other possibilities occur to me, I’ll write to you at once. I like the whole idea. The contract between Moskowitz and Starrett. By 1966, Starrett was 80 years old and his eyesight had started to fade. This was a real handicap for a man who made his earning from reading and writing. Seaports in the Moon had been published in 1928. Thirty-eight years later, this contract was signed. I am no expert on the copyright provisions of the 1960s, but getting permission from a living author to use his work was probably a wise move. Moscowitz paid Starrett $50 for permission to use the story. Was this a fair price? Starrett certainly seemed pleased. The phrase “quite satisfactory” has an echo of Nero Wolf in it, don’t you think? “I like the whole idea.” Indeed, the finished anthology is the kind of book Starrett would have loved. That long scratched out portion of the contract? It says “Seekers of Tomorrow (The World Publishing Company)” Seekers of Tomorrow was another Moskowitz anthology, published in 1965. The short scratched out portion says “author or.” I think. In his preface to the story, Moskowitz recalls how Starrett started a national craze by publishing an article in The Saturday Evening Post, “Have You a Tamerlane in Your Attic?” The resulting hubbub can be found here. “All this is by way of validating Vincent Starrett’s impeccable credentials for writing a story in which Edgar Allan Poe is the chief character,” notes Moskowitz. My advice? Hunt down a copy of either Seaports in the Moon or The Man Who Called Himself Poe and enjoy Starrett’s fanciful speculation on EAP’s final hours. Seaports in the Moon, Edgar Allan Poe, Vincent Starrett, The Man Who Called Himself Poe, Sam Moskowitz, A Man Called Poe, WIliam Legrand, William Legrand, The Gold Bug, Captain Kidd, The Saturday Evening Post, Have You a Tamerlane In Your Attic?